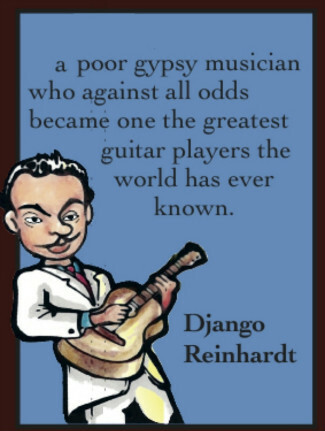 Jean Baptiste (Django) Reinhardt 1910-1953 - Guitarist/Composer born to gypsy parents in Belgium. Though he never attended a day of school - he could barely write his name - he possessed the qualities of a prince and the gifts of a genius. At the age of 18 he lost the use of two fingers on his left hand when he was severely burned in a fire. As a result of this accident, he devised an entirely new approach to the guitar, creating a voice for the instrument that is unsurpassed, even today.